I’ve had many conversations as a result of these wristbands, and I stand by my belief that without discourse human beings will remain divided. If you disagree with the BLM movement or Campaign Zero and would like to have a conversation feel free to email me. 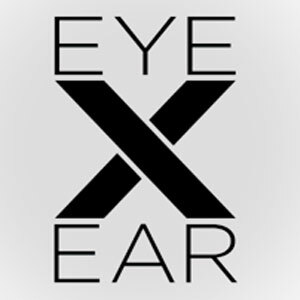 Additionally, this project continues to educate me, and if there are any organizations out there, that wish to partner, or would like to take this operation over entirely, please email me. In 2016, after a trip to New Orleans and a conversation with a man named Don Edwards. I found myself wanting a Black Lives Matter wristband. It’s different than attending a protest or echoing on social media. To me, the wristband provided a way in which I could present my stance on a daily basis. Without diving into the politics of this statement, I wear a BLM wristband because black lives matter to me. I searched the conventional channels for acquiring a wristband, eBay, Amazon, Etsy. I even found them on Aliexpress, direct from China for $1 shipped. I didn’t keep looking for wristbands because I couldn’t find them, I kept seeking because I was looking to purchase from an official organization or a black business owner. Around every turn, all I could see were businesses trying to capitalize on what was “trending” at the moment. The same company on Amazon sells Black Lives Matter, Blue Lives Matter, Donald Trump hats, Pride rainbow flags, and on an on. I understand that there are “promotional” companies out there that are trying to make a living, but this doesn’t feel right, and that is not an operation that I am willing to give my money to. 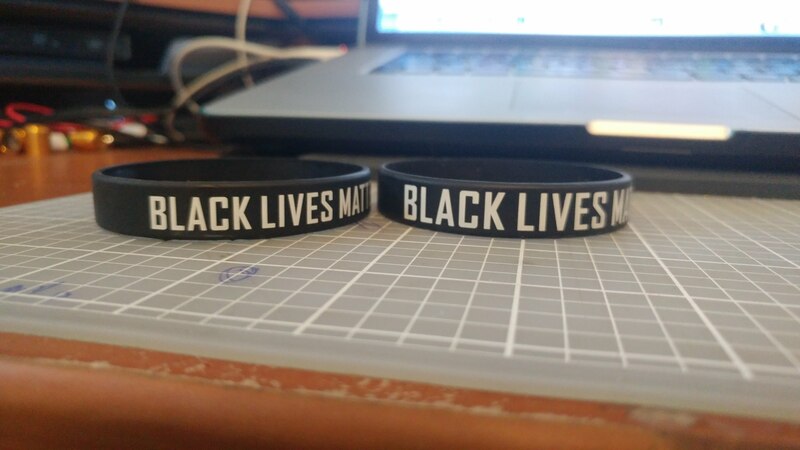 At the time one BLM wristband was priced somewhere between $1-4. I looked into online wristband printers and found that you could get 200 custom made for $56. ( that’s $0.28 per band). I figured, I would get one wristband for myself and see if anyone else would want one, if not, then I’d have plenty of backups. 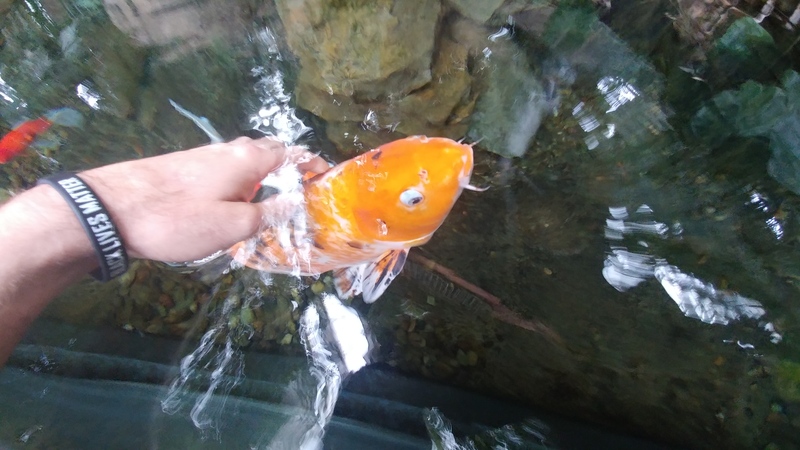 I purchased from a manufacturer in Texas. ( Federal prosecutors would later bust a number of these USA wristband companies for price fixing: link). I received my 200 bands, put mine on, and went out to see if anyone else wanted one. A good number of people in my community did. With about 100 remaining I asked a local coffee shop owner if I could leave the rest in her shop. She gladly accepted. In less than 3 days all of the wristbands were gone. It was clear that 100 bands were not enough. 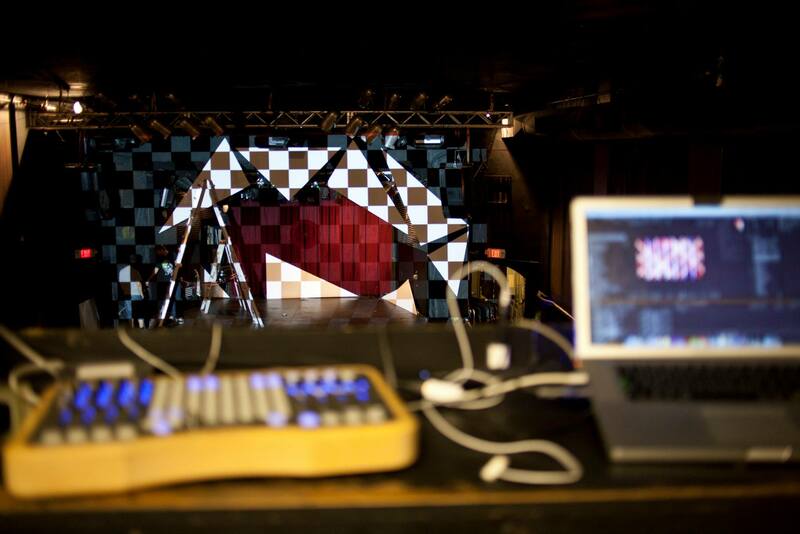 With extra cash from a VJ gig, my next order was for 1000 wristbands. (@ $180 or $0.18/pc). I handed a few hundred wristbands over to the coffee shop owner and went to another coffee shop, and then another, and then a community center. I was out of wristbands within a week. The other locations would be out within a month, and next thing I knew, I was using Xmas money to buy 2100 wristbands ($357, $0.17/pc). These bands took another 3 months before they were out. I knew I wanted to get the prices down, and around the same time, the supplier that I had been going for started upping their prices on me. Instead of a few thousand for $0.17 a piece they were asking near $0.30. So I sourced from another supplier and let me tell you — not all wristbands are made the same. This time I would get 3100 wristbands for $423.90 ($~0.14/ band). I wasn’t happy with the quality of these wristbands, but I couldn’t afford to go another route. It took a few more months to get rid of 3100 wristbands, and by then I had two coffee shops pledging support for the next order. I started the Etsy store as a way to undercut the other hypocritical BLM wristbands, get them out there for those who wanted them and offset the costs of giving them out locally for free. If someone bought one, they paid for one for someone else. A hundred or so, orders came through Etsy and helped offset the costs, but in all reality, I would always add extra wristbands to every order, some orders I would refund the buyers and send them what they wanted anyway. Other custom orders would end up getting enough wristbands for a school, wedding, or significant event and I would only ask them to cover shipping. I wasn’t trying to be a “smart business person.” The point was to get more wristbands out there, and that’s what was happening. Around this time the USA manufactures were adding more “fees” to my order quotes. And to be honest, I’m not sure any of these wristbands were ever actually made in the USA. Especially after receiving multiple bags of wristbands with Chinese characters on them. 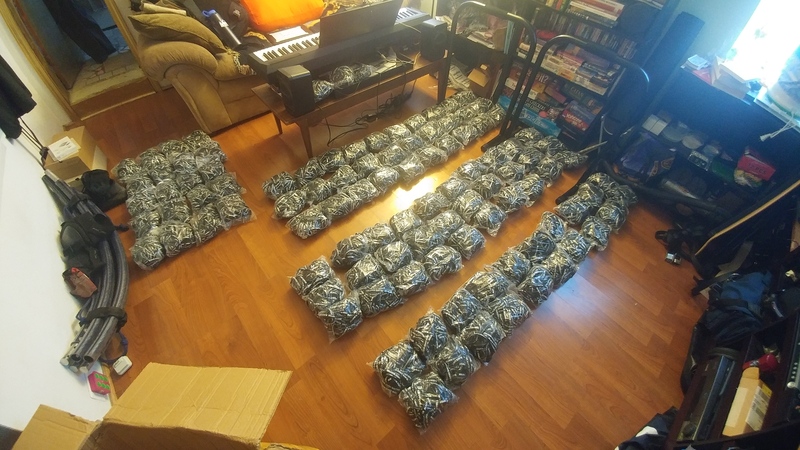 With about $350 in donations and ~$100 from Etsy orders, I set out to place an order for 10,000 wristbands direct from the source, China. I won’t go into all the midnight-3am conversations about wristbands, sizes, and options, but what made it easy were the quotes they were giving me. 10,000 wristbands ( Adult & Youth sizes) for $836 (~$0.08/pc) half the price of any USA “manufactures” and delivered in 1/4th the time. My friend Alex updated the font design, I placed the order, and they arrived as expected and with better quality than I had been getting. Not to mention, the bags had the same stickers on them as another “USA” wristband manufacturer. That’s right! The USA manufactures were middleperson-ing these Chinese operations. I’d later find all this out after multiple query emails and their price-fixing court case. I know this has been a lot to read, but I am writing it down because I want to be as open about my process as possible. It took much deliberation before I opened up the Etsy store, but I couldn’t afford to continue printing and paying for them on my own. Not including the time spent mailing, communicating with manufacturers and buyers, cost of labels, tape, packaging materials, and the chunk the USA government takes for my taxes. Etsy only accounts for a total of 434 orders over the last 2 years, but with its support and that of one other donor, I was able to distribute over ~26,000 BLM wristbands and only come out of pocket $~43. Most of which were given away free locally. The wristbands are now listed on Etsy two for 0.20 because Etsy won’t let me go any lower. (They take $0.20 to relist the item and 5% transaction fee on the sale including shipping). Making money is not the point of listing these on Etsy. 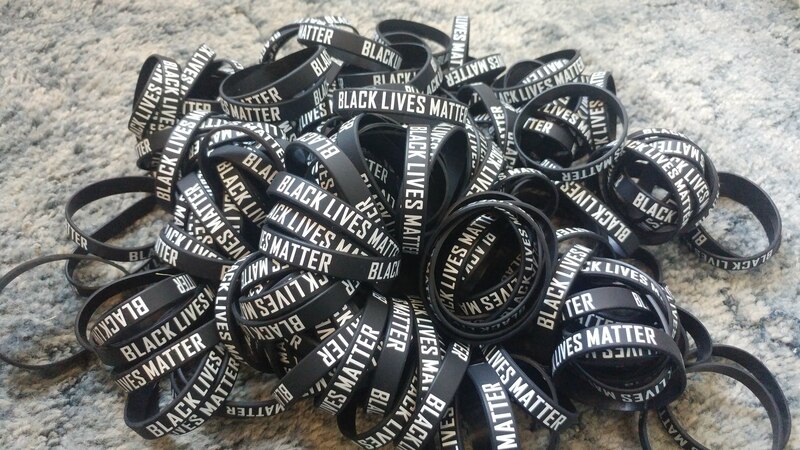 Coming up to the two-year mark of when this all started, I continue to distribute BLM wristbands and learn from doing so. Ideally, I like to hand this process off to a non-profit group that could take it a step further. I have other projects and techniques that I am developing to “start conversations.” I will document them as I can in the future. A few takeaways I’ve learned from distributing these. Peoples attention spans are short. I would see weeks go by where the rate of restocking coffee shops and Etsy orders would grind to a halt. Then another person would be shot, and it’d spark back up for a little while before ramping down again. The issue doesn’t go away because the media cameras do. Familiarize yourself with Campaign Zero. It’s a 10 point plan for ending police violence in America that benefits police departments and all people who live within the United States. Hard conversations matter. 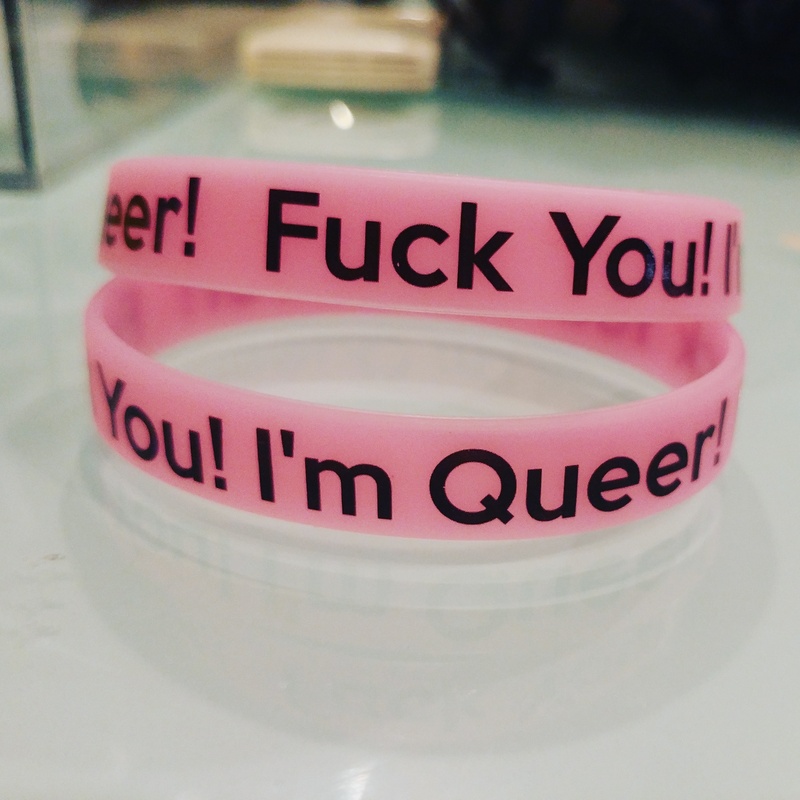 There have been times when my stomach has twisted inside and out while engaged in a conversation about this wristband. I’ve spoken with people from all walks of life including police officers, and if anything, it only makes it more evident that more conversations need to happen. There are shades of grey to every issue, nothing is black or white, and if we force it so, then we’ll never change, only divide.